Sideboard, probably Providence, 1803. Mahogany and light and dark wood inlay (primary); cherry, pine, yellow poplar, and chestnut; silver plaques. H. 40-3/8, W. 66-1/8, D. 23-7/8 in. Private collection; photo by Richard House. (RIF1352). The exhibition Art and Industry in Early America: Rhode Island Furniture, 1650–1830 is the culmination of more than a decade of research on the woodworkers and furniture of Rhode Island, resulting in an ongoing database of 3,000 objects available online in Yale University Art Gallery’s Rhode Island Furniture Archive. 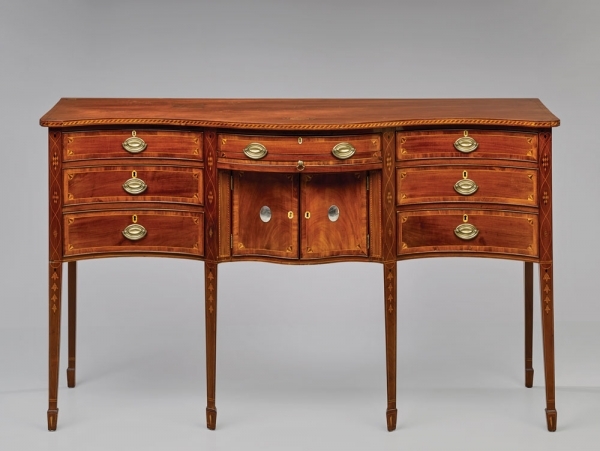 Art and Industry presents a comprehensive survey of Rhode Island furniture from the colonial and early Federal periods, including case furniture, formal seating furniture, clocks, and Windsor chairs.